All of a Sudden | Kent Falls Brewing Co.
A big part of that will be repurposing the front of the barn for on farm sales in it’s own dedicated area – no longer in a room of the old farmhouse that was simultaneously being used for a multitude of other things. 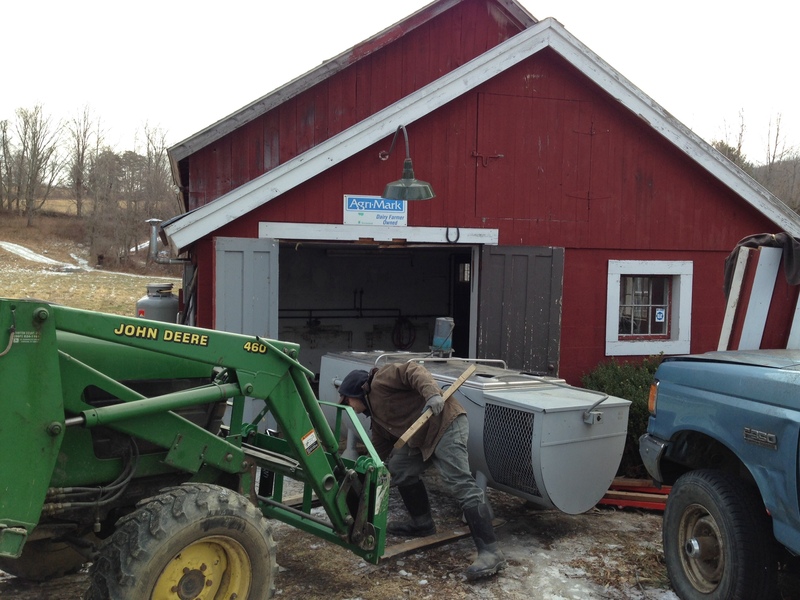 So one day last week, John began cleaning the old milk room out and it soon became apparent the milk chiller-coolship-to-be would have to be moved in short order. With surprising ease, the milk chiller made it’s way out of it’s old home and on toward it’s new life as a fermentation tank. Questions immediately began to swirl around – can we use it if it is placed just outside the brewery service entrance? Do we put it in the brewery and figure it out from there? Do we store it in the barn until a more concrete plan could be put into place? Could we even maneuver it out of the old dairy barn and lift it with the tractor??? Ultimately, there was only one thing to do. 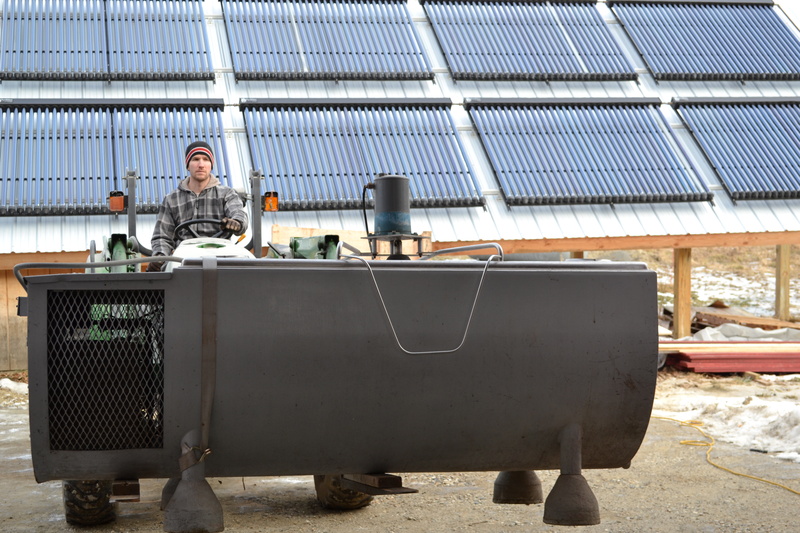 Grab the pallet jack from the brewery, get the forks on the tractor and turn those far off “future” plans that have floated around for so long by moving the milk chiller into the brewery. Thankfully we have a lot of floor space at this point, with only three fermenters, a brite tank, and 16 oak barrels residing on the brewery floor. One thing that was 100% certain about the milk chiller, is that it would need a thorough cleaning as soon as it entered the brewery. Two plus years sitting idly in a barn after years as an active milk chiller in a less than fully sealed barn is not an ok condition in which to have it rest so close to our brand new brewhouse and tanks. So I jumped in and got to work. Plenty more cleanings to come. The exact use of the tank has yet to be fully determined, there are a multitude of great options so the thought is we might as well try and use them all. In the spring we can move the tank outside to allow wort to chill overnight and be inoculated by wild yeast, we can fill the tank with local fruit picked that day and add fermented beer to it so that it can consume those sugars for an extended period of time and not tie up our main fermentation tanks, we can fill it with fresh wort and pitch yeast to experiment with open fermentation and kräusening and many other options. I have begun reflecting on the suddenness that one of the original sparks to this dream of mine has become a reality. 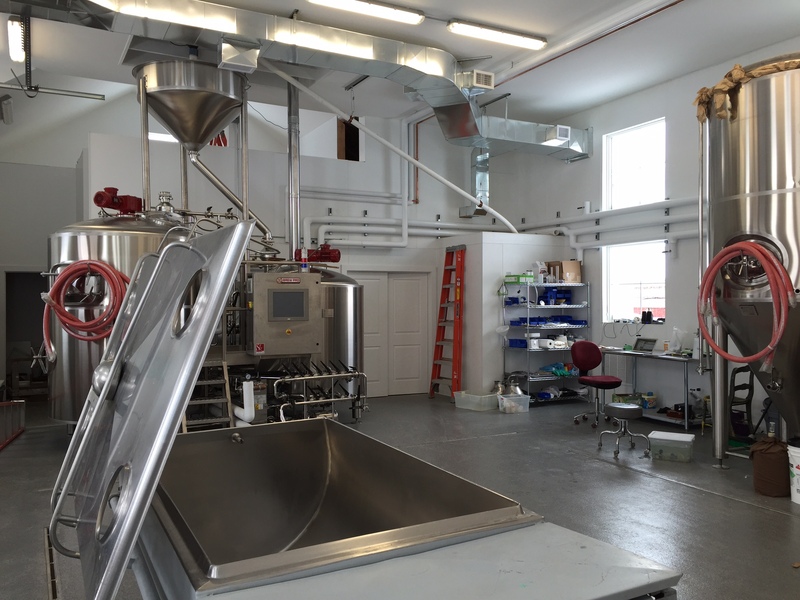 So much has transpired in the past two plus years that this brewery has been in the works, that actualizing the repurposing of the farm’s milk chiller, one of the main cogs in their operation (aside from the cows and farmers of course!) means a whole lot more than an additional 7 barrels of fermentation capacity. In many ways, it feels like an anchor to the original dream. In a few days, the fittings to complete the milk chiller-fermentation tank conversion will arrive. And a few days after that, the brewery will be fully operational. Tuesday was supposed to be a BIG day for us. All of our contractors and the brew house manufacturer’s technicians were going to be on site to run through the system and ensure all connections were made properly. After that, we’d do our first water brews – simulations of the brewing process using only water to acclimate ourselves to the system, the multitude of valve, using steam power and serious pumps/hoses instead of one or two backyard propane burners and home-brew pumps. Unfortunately the “snow storm of the decade” didn’t allow anybody to make it, and we postponed until Monday. 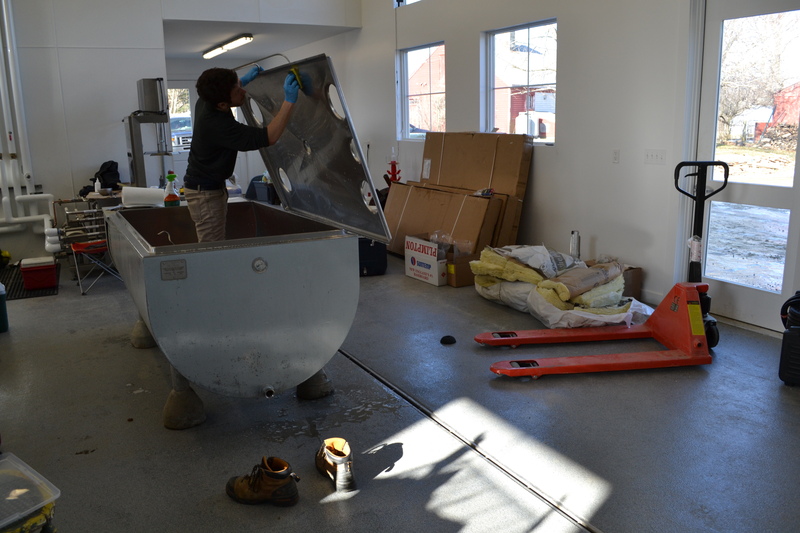 So in the meantime, we used the time to clean and setup the brewery for the official start to operations next week. And we cannot wait. And then all of sudden, we’ll be packaging beer for you.